Last night, as Jim and I were returning home to the 5th wheel after dinner out, he said, “We need to write another post.” He also let me know that I should be the one to do it. Too tired last night, I had to be like Scarlet O’Hara and “think about that tomorrow.” Now it is “tomorrow,” so I’ve been thinking about that. We’re both a week older, as is almost everyone else still living on the planet; the exception would be those born during the course of this past week. Since Jim and I both have birthdays coming soon (Jan. 4th for me and Feb. 2nd for him), that is something on my mind this time of year, but it is not the reason I’m rambling about being older. It is because life has gone on as usual this past week even if we do live in an out-of-the-mainstream home. We’ve cooked, cleaned, shopped for groceries, done laundry, and kept our granddaughter Presley, who was sick, while her Mom and Dad took her older brother to Vanderbilt for a consultation prior to having some procedures done (tubes in ears, tonsils & adenoids removed) in January. On Saturday, between doing laundry and going to the grocery store in Lewisburg, Tennessee, we found a new place to eat: Mildred’s. 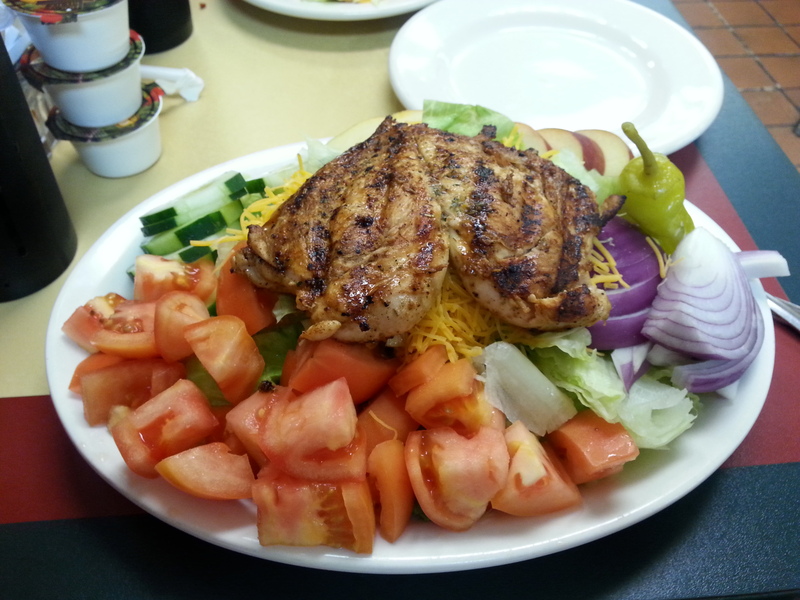 Below is a picture of the grilled chicken salad I received. What you can’t see is that buried under the butterfly chicken breast is a mound of chopped lettuce and grated cheese. I could only eat about half of it. Who would have expected so much food for only $6.99? Jim left his hat there Saturday, so he had to go back Sunday to pick it up. I think it was an excuse to eat there again, especially since he knew I’d be away for a bit and not cooking (other than the pot of chili I made before leaving). The lunch all-you-can-eat salad and hot bar is $6.25 weekdays, $6.50 on Saturdays, and $7.99 on Sundays. True Southern Fried Chicken seems to be a daily staple on the bar, but he also got some tastes-like-homemade turkey and dressing on Sunday. Sunday, I drove our youngest son Nathaniel from Winchester, Tennessee, back to Savannah, Georgia. He and his wife have been going to graduate school there, and they are moving to Winchester to complete their respective programs in the spring semester. He will be working as a physical therapist (internship? residency? – not sure of the correct term), and she will be doing her student teaching in Special Education. Graduation is May 9th, Nathaniel’s birthday. He will receive his doctorate in physical therapy, and Rachel will receive her master’s in special education. We’re so proud! In the meantime, they are moving back to Tennessee. 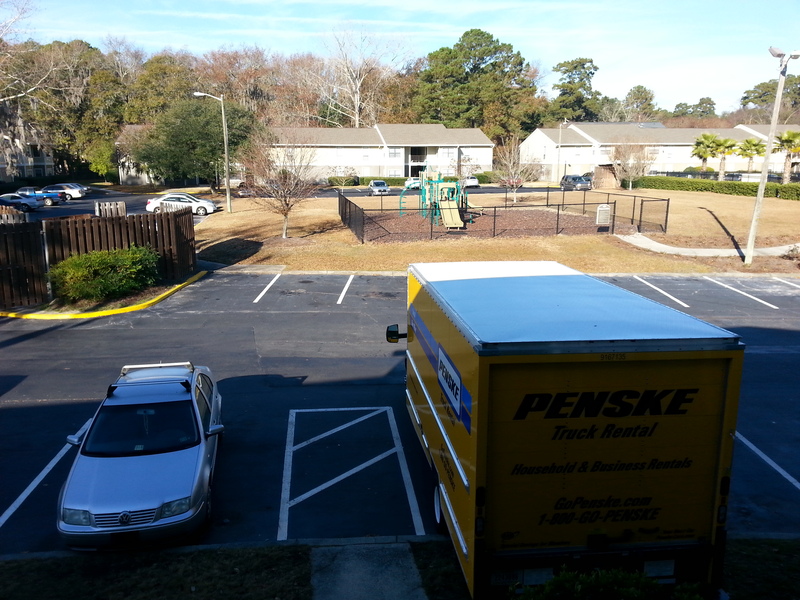 He drove his truck loaded with items up on Saturday, and then he needed to get back to Savannah to load the moving truck and drive it along with Rachel in her car yesterday and today. I stayed over Monday and Monday night to try and help them do what they needed to get done to be ready for yesterday. I don’t know if I was much help or not, but I tried. I got home late yesterday afternoon (Tuesday), so that is why my sweet hubby took me out to eat last night. He knew I was tired! Today, we are going to get the rest of our Christmas gifts wrapped (or refreshed, for those that have been wrapped for six weeks and moved around several times) and begin making deliveries. Since Jim and I are going to spend the week of Christmas with his family in Southern Illinois (camping in Paducah, Kentucky), we need to deliver Christmas goodies to those in Southern Middle Tennessee and Northern Alabama over the next few days. Christmas goodies and birthday gifts were mailed last month to our family in Virginia. Whether you live in a mansion, a farm house, an apartment, or an RV, life keeps going, and I am so thankful that it does!